Emmy-nominated photographer and filmmaker Pieter ten Hoopen’s exhibition in Fotografiska’s video gallery comprises his film Hungry Horse and images from his eponymous book. Two different expressions of the artist’s attempt to describe and shed light on American society, which has provoked mixed, and strong, emotions. Far away from the picture of the "Land of Promise". In September, Pieter ten Hoopen was nominated for an Emmy for his film (se the trailer here) which is the culmination of a decade-long documentation of life in the small town of Hungry Horse in the Rocky Mountains of Montana. The project began when George Bush was re-elected and was fighting terrorism. It was a time when the gap between the rich and the poor widened. Hungry Horse is a photographic rather than factual documentation of the state of mind of the people of the region and its landscape. Ten Hoopen wanted to get beyond the clichés of a country that many people have very distinct ideas about. Reproduced in movies and books, the stereotypical image of America is alien to most of the inhabitants of this small town in the Rocky Mountains. These are people who have been hit hard by the recession and unemployment. People plagued by drugs, poverty and loneliness. The many aspects of the place and the people are brought out in a poetic and emotional work about our society and the time in which we live, sparking as many questions as answers. 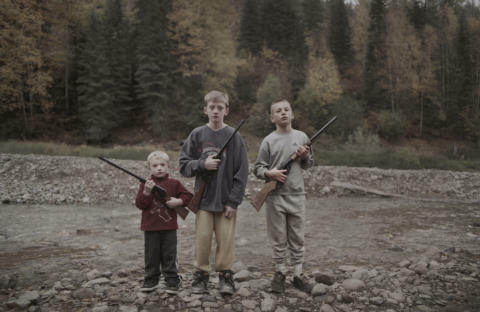 The images displayed at Fotografiska are ten Hoopen’s artistic interpretation of the state of the place, while the film, in the style of a documentary, provides the people with a platform to express their own views of the situation. The work has been nominated for an Emmy in the New Approaches: Arts, Lifestyle and Culture category. The exhibition also includes a film by Peter Hoelstad in which journalist Lasse Bengtsson interviews ten Hoopen about the project and shows what happened when Hungry Horse was screened at the local saloon. Fotografiska is one of the world’s largest venues for photography. No ordinary museum, Fotografiska is an international meeting place for knowledge and to experience the infinitely expressions and meanings of photography. Fotografiska’s mission is to make accessible both established and cutting-edge photography. To position Sweden in the world, and the world in Sweden. And further more: photography is the technic to capture life. We provide and support life worth capturing.